Ah, that Anna Karenina dress! It fits her better now! She just looked like a skinny chicken wearing it before. Oh Lord, I never thought I’d come to hear THAT TUNE AND THAT SONG at a Korean show! Alla Pugacheva, everyone. Lol. 1980s! I guess both Wakaba and Marin have got some catching up to do. And is across the world just Japan in your case? SOI US and Canada have got drastically different sets of skaters. Right, getting up at 4 a.m. for Yuzu is just what I always enjoy! Yuzuru Hanyu: Return to his Origin “The choice of music means that I won’t be challenging only myself as a rival, I will also be challenging Plushenko-san. But the last thing I want is for his image to drown me and for people to feel ‘it’s just an imitation of him’ “I am not thinking in terms of surpassing him – on the contrary, this program is my expression of my respect to him. That’s why I deem it important to create my own Origin while still paying tribute to him” (Yuzuru Hanyu) ------------------------------------///-----------------------------------///----------------------------------///----------------------------------- Yuzuru Hanyu’s post-Olympic free program received a symbolic title, Origin. The return to his beginnings in figure skating. According to Yuzuru (Figure Skating Life, vol. 15, 10.10.2018), the program is full to the brim with what he values in the sport he loves. Apart from technical elements which help him gain points, Origin also contains certain choreographic nuances showing the experience of the two-time Olympic champion and his tribute to his competitive career. Yuzuru’s interviews after the open practice on 30.08.2018 in Toronto: “In the third or fourth form of the primary school I skated From Russia With Love, and ever since then the Russian and European styles have been particularly close to me. The expressiveness of the European and Russian school, their musicality, their way of telling the story – they were all my reliable starting point. I was also taught to appreciate it by Tsuzuki-sensei. His origin was also in Russia, so he taught me Russian and former Soviet style, and I took over their expressiveness. That’s why Origin has a profound meaning to me – I feel as if I am going back to my Origin. It’s not only choreography, beautiful gliding, traditional expressiveness, use of arms, but the inclusion of different jumps in any place, and the use of sound which create totally different impressions – these things became my Origin.” (c) Yuzuru picked out two musical pieces out of Tribute to Nijinsky skated by Evgeni Plushenko, his idol since Yuzuru was very young. But Origin was envisioned and interpreted in a different way. According to Yuzuru, this program is an embodiment of his childhood dream and the return to the starting point in his own skating career. “I’ve always wanted to skate this program, but I knew it was a signature program for Plushenko. I’ve just restrained myself for a long time and thought I shouldn’t be doing it, but after the Olympics, I felt it was just what I needed. Even as a child, I felt an incredible aura when I saw him skate Nijinsky: Nijinsky’s poses, the moves which match every sound, the jumps – these details were etched into my memory”. (c) The program got choreographed by Shae Lynn Bourne. Shae Lynn in her interview pointed out that what makes working with Yuzuru special is that you know right from the start where his big line up of jumps will be placed. The free program got shorter by 30 seconds, so where you place the jump elements is of crucial importance. Yuzuru knows what he has to do with his jumps. Shae deals with the story, emotions, changes and highlights. When Shae Lynn shared her vision of the choreography for the program, ‘his eyes went big’. Shae Lynn was inspired by the Kojiki mythology of the creation of Japan, which underlay the program for her. She thought that Yuzuru as a creator who wants to push the limits of human possibilities3would be the best candidate to show the story. She pointed out that the otherworldly aura Yuzuru has brought about the vision of him developing this world of his from the ground up. And he enjoys creating it. So the idea of the program for Shae Lynn was a god coming out from the underground upwards, starting to live as a human being, experiencing human feelings, the touch and the pain. But the Japanese mythology was Shae Lynn’s vision, but Yuzuru is certain to have his own ideas about the program. He said he was to skate the program in Russia, possibly with Plushenko watching him, so he wanted to give a good skate there. His first GP event also happened at a place which was memorable to him, Helsinki, the place of his first international competition, so he wanted to skate in memory of that too. The result of the collaboration of the skater and the choreographer is a brilliant program with a complex choreographic pattern which emphasises the musical structure with a frequent change of rhythm. The composition of the program The original technical layout included four quadruple jumps, two of which were executed in the second half of the program, and two triple axels: 4Lo, 4T, CCoSp, StSq, 3Lo, 4S3T, 4TEu3S, 3A2T, ChSq, 3A, FCSSp, FCCoSp He planned upping the layout, and the final variant should have looked very ambitious – 4A instead of 4Lo. Yuzuru showed an updated technical layout at his first GP event in Helsinki already: 4Lo, 4S, FCCoSp, StSq, 3Lo, 4T, 4T3A SEQ, 3F3T, 3AEu3S, ChSq, FCSSp, CCoSp The change of the layout and the choreographic pattern of the program was due to Yuzuru’s wish still to include two triple axels while dispensing with double jumps in jump combinations, which he still kept in the bonus part of the program. 1. The program included the unique sequence 4T3A executed in the second half (as the fifth jump element) – an innovative difficult element in men’s figure skating. 2. The triple toeloop was taken to the bonus part of the program and is jumped with 3F (as the sixth jump elements off a difficult entry). The last time Yuzuru did such a combination was in his junior years. 3. 3AEu3S became the last jump element executed off a difficult entry. 4. 4S was moved into the first half of the program, and replaced by a solo 4T. 5. The place of two combination spins and certain difficult variations of basic positions changed too. The flying change foot combination spin FCCoSp is executed before the step sequence, and the change foot combination spin CCoSp is the last element in the program. Thus, the losses in the basic value in jumping a jump sequence (valued with 0.8 coefficient) are minimised with the replacement of 2T for 3F and the execution of sequence 4T3A and jump combination 3F3T and 3AEu3S in the bonus part of the program (valued with 1.1 coefficient). The maximum base value of the program with the Lvl4 non-jump elements is 91.43 points. The result of these replacements were the changes in the choreographic pattern in the program and skating transitions. The rearrangement of placing the three jump combination turned the choreographic step sequence into a combination transition elements between the two combinations (3F3T and 3AEu3S). The gorgeous Ina Bauer marks the beginning of the new choreographic sequence between the three jump combination and the two final spins. Thus, the second half of the program starting with 4T3A SEQ is in fact one continuous choreographic sequence. This packed footwork is made furthermore difficult by three changes of the musical tempo. Currently, Yuzuru Hanyu is the only figure skater whose programs combine a highly difficult technical content with highly complex skating footwork. The elements which are incorporated into the composition of his program, the depth of musical interpretation make Yuzuru Hanyu’s programs special, both his showpiece and his pride. Many thanks to him that he persists in striking out a line of his own without lowering his standards. “You’ll really see his quality through his skating, and many levels – faster footwork, faster feet, his maturity, he has a lot to express now, he has a lot of experiences now – two-time Olympic champion!” (Shae Lynn Bourne) The musical structure of the program consists of three parts, the basis of which were made of Art on Ice and Magic Stradivarius by Edvin Marton. The composition of the program shows the correlation of elements and transitions between them with the musical phrasing of each part of the program: 1. Opening (Art on Ice musical theme) Transitions – entry (7s) – 4Lo Transitions – entry (9s) – 4S – FCCoSp The beginning of Art on Ice theme is most hypnotic in its mood and emotions, full of various sound effects: the moan of the wind, sharp abrupt whistling sounds and gong beats. The first deafening bang on the gong precedes 4Lo. These enigmatic mysterious musical themes get more powerful on the entry of 4S. The growing tenseness of musical intonations reach their culmination towards the end of the fragment, which is shown choreographically with the exit of the combination spin and the transition into the step sequence. 2. Development (Magic Stradivarius with a change into Art on Ice) The change of tempo StSq (42s) The change of tempo The change of musical theme Entry (4s) - 3Lo - exit Transitions - entry (7s) - 4T - exit Transitions Entry (7s) - 4T3A SEQ - exit The change of tempo Transitions - entry (4s) - 3F3T - exit - transitions The change of tempo Transitions - Entry (5s) The fragment has a change of musical themes: Magic Stradivarius on the step sequence and the transition to Art on Ice after the element. Compositionally, the transition is emphasised by a stop and a choreographic posturing before the entry into the triple loop. The fragment has four changes of tempo: the fast tempo during the execution of the step sequence with the gradual fading of musical intonations toward the end of it; the slow tempo during the execution of the next jump elements, 3Lo, 4T and 4T3A SEQ; fast tempo again during the skating transitions into the 3F3T combination and after the exit from it; slow tempo when doing transitions into the entry into 3AEu3S combination. 3. Culmination (Art on Ice theme) Counter 3AEu3S - exit ChSq (12s) - FCSSp CCoSp The culmination of the program starts with the 3AEu3S combination with the subsequent transition into the Ina Bauer, the signature element of the choreographic sequence ChSq. The crescendo of musical intonations culminates during the final combination spin. The melodic peak of the culmination is brought into focus by a striking musical accent in the magnificent final pose. Thus, all the parts make the integral whole in composition (movements & parts of the program to match the musical phrasing) and in interpretation of the program. “As his choreographer, I wanted to show his quality, to show what he’s capable of. Right from the opening position, I want it to be different, and original, and unique, as he is. So really, I took my time with each piece to see it change, and to see something new for his audience in him, on an emotional level, but also on the skill level. I wanted it to be a different version of this music. Make people feel something new from it.” (Shae Lynn Bourne) The video of the skate The choreography of the opening of the program is based on the accentuated amplification of the sound with the use of combined skating transitions and diverse precise movements of the upper body and arms in accordance with the style of the program. 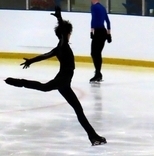 The unusual starting pose might be a reference to his origin – the 2007-2008 Firebird program. In Shae Lynn’s conception, a slumbering Deity emerges through the earth, rising like a tree from the soil. 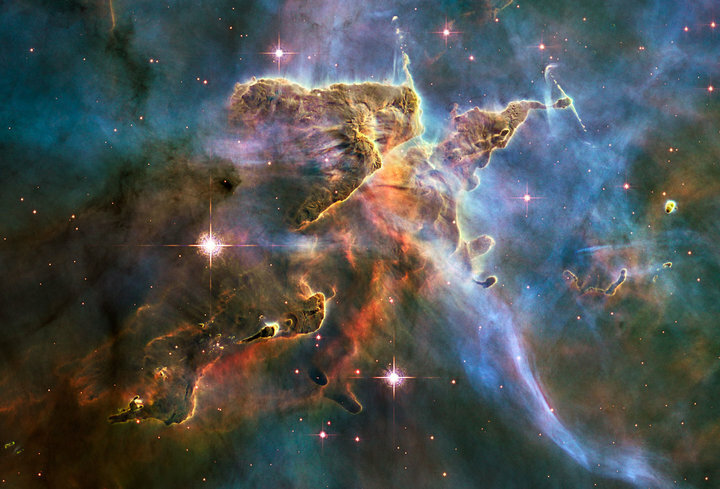 Two powerful accentuated head bumps resembling two loud heartbeats show the final awakening. Then the Deity starts discovering and experiencing the world of the humans through ‘touches’ and he remains in this world. The idea of experiencing the world through touch can be seen in the precise arm movements throughout the program. The choreographic posing, a move with the change of direction and the accentuated movement of the upper body and head, the change to moving forward, waltz three turn LFO, crossed step RBO/LBI, change to moving forward, two progressive runs. The start of the entry into the first jump coincides with new sound effects in addition to the principal sound of the wind howling. The choreographic end of the entry is emphasised by a strong beat of the gong, which sets the viewers ready for the 4Lo, a jump of immense complexity, a jump which Yuzuru enters with the gracefulness of a panther before a leap. Chasse LFI/RFO - Mohawk RFI - chasse LBI/RBO - Mohawk RBO – crossed step LFO/RFI - Choctaw LFI – 4Lo. So the jump is executed at the end of the musical phrase to the booming echo of the gong beat, showing the mastery of combination of the sound and the movement. The change to moving forward at the start of the new musical phrase, waltz three turn LFO, outside spread eagle transitioning into a besti spread eagle to the second gong beat. Waltz three turn RFO to the ‘tum-tum’ sound effect, waltz three turn LBO, rocker RFO, crossed step RBO/LBI, wide step LBI/RBI. The beginning of the entry into the second jump is indicated by a new sound which resembles a distant thunder: crossover – chasse – crossover – three turn RBI – crossed step RFO – wide step LFI – Mohawk RFI – chasse LBI/RBO – Mohawk RBO – Mohawk RFI – backward power three turn RBO – 4S The growing intensity in the musical intonations is shown choreographically through the entry and execution of the jump at the peak of the musical phrase. The interaction of movement and sounds allows incorporating the element into the rhythmic pattern, giving it additional power and vividness. The intensification of the musical intonations during the subsequent combination spin is accentuated again through a booming thunder. Change to moving forward, wide step LFI/RFI, three turn RFI, a jump into a camel spin and FCCoSp Spin difficulty features: 1) a difficult variation of camel spin (with the upper body upward); 2) difficult variation of camel spin (doughnut); Change of right foot to left foot 3) difficult variation of the sit spin (Broken Leg sit spin) 4) Difficult variation of the upright spin (A-spin) (At Rostelecom Cup Yuzuru was planning to do a difficult variation of the upright spin (Bielmann spin) as a tribute to Plushenko). All the features counted in, so it was deemed a Lvl4 spin. All the difficult variations of the basic positions match musical bars, and the change between them is brought to the fore by musical accents ('Tum-tum' in the camel spin and the booming thunder sound in the sit spin) The accentuated use of both arms in the first difficult variation of the camel spin (a soft movement upwards with its subsequent smooth lowering) highlights the shift of tones in the musical intonations. “This program means a lot to me. In a sense, choreography adds up vitality to the music. The way you love the program changes the program” ((c) Yuzuru Hanyu) The next part of the program – the Development– starts with the change of the musical theme for Magic Stradivarius and coincides compositionally with the start of the step sequence StSq. The choreographic pattern of the step sequence is fitted to the musical pattern dominated by the violin theme. The interpretation of music is brought to the fore not just by steps, turns and elements matching the length of rhythmic beat, but also by precise use of the arms and upper body. Enjoy it! Inside Ina Bauer, Euler ccw, chasse LBI/RBO, Choctaw RBO/LFI ccw, chasse RBI/LBO, a leap on the left foot, crossed step LBO/RBI, leap cw, bracket LFO cw transitioning into a mini Ina Bauer. The change (acceleration) of the musical tempo at the beginning of a new musical phrase is reinforced by dynamic and fast execution of step sequence elements. Twizzle RBO (2 rotations) ccw, Mohawk RFI/LBI ccw, twizzle LBI (1.5 rotations) ccw, loop LFO ccw crossed step LFO/RFI, Mazurka (toepick) jump cw, twizzle RFO cw, chasse RBI/LBO, Mazurka toepick jump cw transitioning into a lunge with a change of direction ccw, waltz three turn LFO ccw, toepick steps ccw. The beginning of the next musical phrase is indicated by a choreographic Touch posing. “He reaches and then he takes as if he’s touching somebody’s back and feeling for the first time. As if a child (is reaching out for something) for the first time, when you touch them – this is this human thing, TOUCH, which make you feel alive and makes you feel love. These moments touch me and give me those goosebumps! I hope others will also will have their moment when they watch him that stands out for them!” (Shae Lynn Bourne) Bracket LFI ccw, crossed step LBO/RBI, change to moving forward, waltz three turn LFO ccw, change to moving forward, crossed step LFO/RFI, rocker RFI ccw – counter RBI ccw – twizzle RFI (1.5 rotations) ccwwith arms raised and transitioning into an inside spread eagle and a pivot. The stunning plasticity of arms in the spread eagle matches with the drawn out sounds of the violin that it creates an illusion as if Yuzuru plays the violin himself and draws those notes out. The choreographic posing, Mohawk LFI/RBI cw, chasse RBI/LBO The end of the violin solo and the change of the tempo at the start of a new musical phrase are emphasised by the second combination of difficult turns. Rocker LBO cw – counter LFO cw – counter LBO ccw, crossed step LFO/RFI, bracket RFI cw, crossed step RBO/LBI, Mohawk LBI/RFI, wide step RFI/LFI, a swizzle move, loop RBI cw. “There is a moment right before the end of his circle footwork that he holds and he’s arching his back backwards and leaning it into his knees. The movement just grabs me and hooks me. I feel his power and you can see his flexibility and all the space he just takes.” (Shae Lynn Bourne) Step sequence pattern (credit to @kora) The table of difficult steps and turns In my opinion, the technical panel might not have credited the LFI bracket because of the flat edge on the entry lobe. Step sequence difficulty features: 1. The elements which were credited: clean Choctaws (ccw), two rockers (cw and ccw), two counters (cw and ccw), two brackets (both cw), two twizzles (cw and ccw), two loops (cw and ccw). This results in 11 difficult steps and turns. Only 4 types of difficult steps and turns are executed in both directions (clockwise and counterclockwise) – rocker, counter, twizzle and loop. This meets the Variety criterion, the maximum level of the step sequence – 3. 2. There are more than sufficient number of spins to the right or the left with a full rotation of the body at least 1/3 of the pattern in both directions. The feature is credited. 3. There is more than enough of use of body movements at least 1/3 pattern in both directions (the use of head, arms, upper body and hips). The feature is credited. 4. Two different combinations of three difficult turns on different feet were executed (the first on the right leg, the second on the left feet). Both combination are done with a distinct rhythm. The feature is credited. This results in the Lvl3 Step Sequence The element is incorporated seamlessly into the melodic canvas and reinforces the nuances of the musical phrasing. The width and length of steps, turns and the amplitude of elements match the length of rhythmic beats. 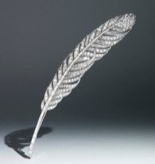 I’ll just draw attention to most outstanding points: the deliberate, non-rushed sequence of Ina Bauer – Euler – Choctaw at the start; the fast-paced twizzles emphasising the picking up of the musical tempo; the lunge and the light toepick steps; the choreographic Touch posing; the combination of the spread eagle and the pivot; both combinations of three difficult turns, the movement with the spine arched back – the swizzle on the lowering of the musical tones. The subtle choreographic touches in the precise moves of the arms and upper body throughout the step sequence show the vivid aspects of musical interpretation. For instance, the Ina Bauer before the series of twizzles, the various arm positions during the four twizzles, the extension of arms when changing to moving forward before the first combination of difficult turns, ‘playing the violin’ in the middle of the pattern. There is also one more moment at the end of the step sequence when Yuzuru seems to be gathering moonlight, holding it gently in his hands and then letting it go (the arching back in the swizzle). You might see something different, though… The start of the new musical fragment is indicated by the return to the musical theme of Art on Ice. The balance and cohesiveness of the composition is achieved through the execution of the next two jump elements – 3Lo and 4T (together with the entry and exit) matching their own musical phrase. The choreographic posing at the start of the melodic phrase, crossover, Choctaw LBO/RFI at the end of the bar – Jackson composite step –3Lo The triple jump 'out of nowhere' is executed at the peak of the musical phrase. The combination transition of three turn RBO – a mini spread eagle and a crossover at the exit choreographically mark the ending of the musical phrase. The change to moving forward at the start of a new musical phrase, Mohawk RBI/LFI, wide step LFI/RFI, Mohawk RFI, chasse LBO/RBI, two crossovers at the end of the musical bar. Lobe RBO at the start of the next bar, crossed step RBI/LBO – change to moving forward – three turn LFO – 4T. The jump is incorporated beautifully into the final of the musical phrase with an addition of an accentuated sound during the three turn just before the jump. The effortless execution of the jump and the catlike graceful exit resonate with the fluid melodic phrasing. It acquires some additional vividness through accentuated sound, the emergence of which is shown through a forward outside three turn which leads to the jumps. It creates a complete harmony of music and form when executing the quad. The exit off the jump – sheer aesthetic pleasure! The change to moving forward and crossed step LFO/RFI at the end of the melodic phrase. An accentuated choreographic posing at the start of the new melodic phrase – a subtle choreographic touch reflecting the change of musical intonations. The cohesiveness of the composition is emphasised through combined transitions after the exit from the solo 4T and the jump sequence together with the entry and exit matching their ‘own’ musical phrase. Waltz three turn, falling leaf jump, Mohawk RFI, chasse LBI/RBO (with a punctuated and barely perceptible move of the right hand) Crossed step RBI/LBO, change to moving forward, waltz three turn LFO at the end of the musical bar. Backward power three turn RBO, two crossovers, three turn RBO, chasse RFI/LFO at the end of the musical phrase. The first steps of the entry into the jump sequence punctuate the start of the new musical phrase. Wide step RFI/LFI, a complex step sequence defined as 'false step' (obmanny shag) in Russian figure skating world (Mohawk LFI, lunge on the free leg, transfer of weight onto the supporting leg, crossover) – change to moving forward – three turn LFO – 4T3A SEQ. Yuzuru demonstrates the musical performance of an immensely difficult element, when both jumps are performed on the musical peak and are brilliantly into the rhythmic pattern of the musical bar. «My life is figure skating. It’s both its origin and its ultimate destination. My foundations” Yuzuru Hanyu, Every, 28.12.2018. Two crossovers and a change to moving forward at the end of the musical phrase. The next element – the trademark lunge on the heel executed at the meeting point of two musical phrases, choreographically emphasises the languidness of musical intonations at the end of the melodic phrase and the upcoming change of the tempo at the beginning of a new fragment. The change of the musical tempo coincides with the beginning of difficult combination transitions before the entry into the triple flip– triple toeloop combination. The length of the steps and turns, and the freedom and amplitude of every move correspond to the length of every rhythmic beat, which reinforces the dynamics of the musical fragment. Toe Walley on the upbeat at the start of a new musical phrasing, chasse LBI/RBO, Mazurka jump, wide step LFI/RFI, Jackson, a difficult combination of turns and steps rocker RBI – counter RFI and chasse RBI/LBO at the end of the musical phrase. At the start of the new musical phrase - a Jackson step, a crossover, chasse RBI/LBO, crossover The start of the next musical phrasing is choreographically emphasised by the start of the entry into the combination of two triple jumps: change to moving forward – three turn LFO (with the right arm raised) – three turn LBI – three turn LFO – 3F3T The interaction of sound and form during the entry and the jump combination itself is very interesting. The difficult entry of many fast-paced three turns highlights the rhythm of the musical phrase, the accentuated tempo-based execution of both jumps in the combination (with landing right on the strong beat) creates a choreographic accent and lends depth to musical interpretation. The combinational transition following this jump combination, which also has an accentuated rhythmic execution of elements, is the last choreographic detail of this dynamic musical fragment: half flip (toe leap), Mohawk LFI, Euler, chasse LBI/RBO, Mohawk RBO, outside spread eagle transitioning into an inside Ina Bauer. Another change of musical intonations into a slow tempo at the beginning of the new musical phrase brings us closer to the culmination. That’s a lull before a storm… Mohawk RBO, crossed step LFO/RFI, a move on the left foot (Touch ©), Mohawk LFI, change to moving forward, waltz three turn LFO transitioning into an arabesque spiral, change to moving forward, waltz three turn LFO, two crossovers (the very length of these basic steps correspond to the length of the rhythmic beat), change to moving forward, three turn LFO, crossed step LBO/RBI, chasse RBI/LBO at the end of the musical phrase. The culmination of the program starts with another change of musical intonations. The choreographic emphasis is placed on the execution of three jumps off the trademark Yuzuru Hanyu entry – outside back counter. Yuzuru started jumping triple axel off a counter at the age of 16. 'He does a triple axel off a counter. It’s very difficult because you have to turn your shoulders, stop the rotation and then enter the jump. I say not every skater from the top ten can do this. Even at a practice’ (Artur Dmitriev Sr, commentating SP at Olympics 2014) Counter LBO – 3AEu3S– mini spread eagle with a precise movement of the right arm during the exit. Both triple jumps are fitted into the musical structure as they are executed to the accents of melodic peaks. The composition of the choreographic step sequence ChSq, which starts with an Ina Bauer and finishes with a hydroblade, has a fierce and magical power highlighting the beauty of the program’s culmination. 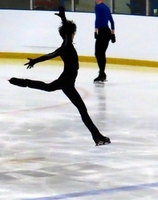 Yuzuru's signature element, Ina Bauer, is the highlight of the choreography of the program. Its significance is brought out to the fore by its execution across two musical phrases. The choreographic pattern overlaps the melodic one, just as the coalescence of moves between the elements highlights the continuity of music. What keeps changing and creating sparkles is its accents. The gorgeous use of the upper body and arms gives a subtle choreographic touch, which emphasise the change of musical intonations at the start of the new melodic phrase. I'd like to point out that the Ina Bauer lasted longer compared to what we saw at GP Helsinki and Rostelecom Cup due to the exclusion of simple steps after the exit off the jump combination (the Ina Bauer at the Worlds was 5 sec. long, at the GP event it was 2.5-3 seconds long). This shifted the choreographic accent marking the beginning of the element. It was something like a gift from Yuzuru. ChSq: two crossovers, Ina Bauer with a choreographic accent on the use of arms at the start of the new musical phrase. rocker LFO, crossed step LBO/RBI. Choctaw LBO, counter RFI, crossover and an accentuated transition into a hydroblade at the end of the choreographic step sequence. Change to moving forward, wide step, three turn RFI and a jump into a change foot sit spin FCSSp Spin difficulty features: 1) Difficult entry with a jump (Death drop jump entry); 2) difficult variation of the sit spin (shoot the duck sit spin); Change of right foot to the left foot 3) Difficult variation of the sit spin (pancake spin); 4) at least 8 rotations without changing the difficult position. All the features are credited. This results in Lvl4 spin. The change foot sit spin is incorporated into the musical pattern and fits musical bars: - the Death Drop entry is executed to the musical break (additional musical bar); - the shoot the duck difficult variation, the foot change and the first three rotations in the pancake sit spin are executed to one bar of the musical phrase; - the remaining rotations of the last difficult variation (pancake sit spin) are executed to another musical bar of the musical phrasing. At the exit of this spin the music gets faster. As the program gets closer to its final, the musical intonations in the last fragment pick up pace. Change to moving forward, three turn RFI and entry into the final change foot combination spin CCoSp. Spin difficulty features: 1) Difficult entry (“travelling camel”); A simple camel spin (with an accentuated opening of hands at the change of edges); 2) change of edges in the camel spin (from inside edge to outside edge); 3) change of left foot to right foot through a Butterfly jump; basic sit spin; 4) difficult non-basic position; Difficult upright position (Scratch spin). The combination spin uses all the three basic positions: camel spin, sit spin and upright spin. The camel spin is executed on the left foot, the sit spin and the scratch spin are executed on the right foot. Four features of difficulty apply. For any change foot spin the maximum number of features a skater can get for spinning on one foot is two. This requirement is met (two positions are done on the left foot, two are done on the right foot). This results in Lvl4 spin. The final combination spin with its variations fits the musical phrasing: the camel spin, change of edge, Butterfly foot change, the sit spin and the non-basic spin are executed to its 'own' musical bar; the difficult scratch spin variation fit two bars. The final pose with accentuated movements of the upper body and arms (the right arm down and the left arm up) represents the unification of the two worlds, the earthly one and the spiritual one. Of the present and the past. "I think Yuzu really believes in himself, and he has that mental strength of staying focused, of sticking to what he believes in, actually believing in himself, he doesn’t have to say it, he just inside knows. He trusts himself and he works towards those goals. He doesn’t let fear get in the way which we all often do. Sometimes fear stops our choices, taking new risks or taking a lead somewhere new. We can get in the way of ourselves. He doesn’t do that – he just goes for it. Maybe some people say why another Olympics, why another Worlds if you already have two Olympic medals? But he has this mission, he believes he can do this quad axel, he believes he can do it and he’s going to go for it. It’s a good message for anyone on earth, this way of living, it’s so important not getting sidetracked". (Shae Lynn Bourne) Many thanks to Anna Zamotaeva and Evgenia Mitrofanova for their translations of interviews, videos and articles from Japanese Respectfully, Yulia. As many might have already heard, Yulia Krivikhina (Yulena) has recently published her analysis of Yuzuru's Origin - a truly enlightening and informative text showing the complexity and depth of his free program. I humbly offer my translation of her work. If there are any corrections, please, don't hesitate to let me know! Oh dear. You can try and google-translate this - no time for me to translate it. Nastya’s comments.